The longer the stand-off between the Juan Guaidó and Nicolás Maduro drags on, the more regular Venezuelans are likely to suffer, it seems. Washington's recognition of opposition leader Juan Guaidó as Venezuela's interim president is being touted by the Donald Trump administration as the only way to restore the country's democracy. 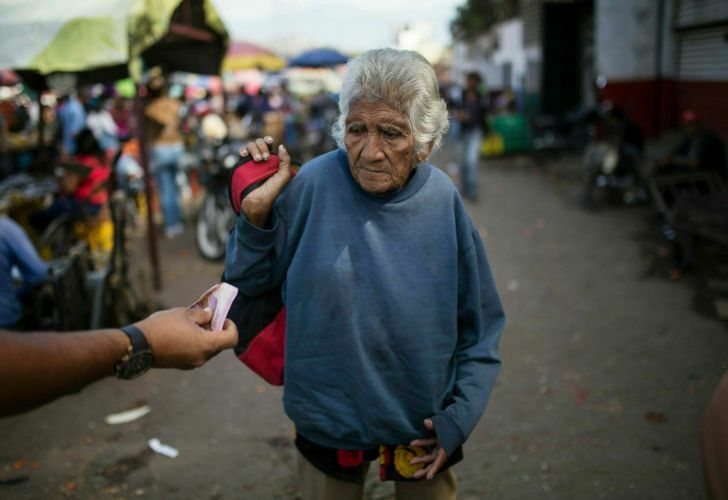 But as Elizabeth Pineda was stocking up on staples Sunday at a sidewalk market near a Caracas slum, she was bracing for things to get a lot worse, not better. A retired secretary, Pineda survives on a monthly pension of just 18,000 bolívares, or about US$6. She supplements her income working as an astrologer, and although the stars have been telling her Venezuelans are on the road to ridding themselves of socialist President Nicolás Maduro, she doesn't expect him to go quickly or quietly. "The government is going to strangle us even more with their bad decisions and shamelessness," Pineda said while sharing a bowl of beef soup with two friends, none of whom can afford the US$1.50 meal on their own. Economists agree that the longer the stand-off between the US-backed Guaidó and Maduro drags on, the more regular Venezuelans are likely to suffer. Pope Francis said Sunday that he is "terrified of a bloodbath" in Venezuela but doesn't want to pick sides in the political standoff because it's not his role as a pastor. Travelling home from Panama in the papal plane, Francis told reporters that he supports the entire Venezuelan population. He called for a "just and peaceful" solution to the crisis in Venezuela that respects human rights and avoids suffering. But he didn't say if the Holy See would recognise opposition leader Guaidó in his claim for the presidency over Maduro. Maduro, who so far appears to have the backing of the decisive military, has dug in, accusing the US of orchestrating a coup by encouraging Guaidó to declare himself interim president and then leading a chorus of nations that immediately recognised his rule. The high-risk and seldom-used strategy of recognising an alternative government that doesn't already have de facto power is tantamount to blocking Maduro's access to Venezuela's all-important oil revenue, with enormous legal and financial entanglements. Directives sent Friday to the US Federal Reserve will make it very hard for Maduro to access Venezuela's overseas assets and earnings, including those from Houston-based Citgo, a subsidiary of state-owned oil giant PDVSA and the major source of revenue for the bankrupt government. Also at risk is $1.2 billion in gold reserves — 15 percent of Venezuela's foreign currency reserves — stored in the vaults of the Bank of England. If the Trump administration's confrontational approach is adopted by the European Union, some of whose members have threatened to recognise Guaidó if Maduro doesn't announce new elections in eight days, it could bring oil production to a standstill, heaping more hardships on the 29 million Venezuelans already struggling with hyperinflation, widespread food shortages and anaemic economic activity. "If Maduro stays in power, Venezuela could suffer a humanitarian catastrophe," said Francisco Rodríguez, chief economist of New York-based Torino Capital. Rodriguez said the outlook is similar to what happened to Libya in 2011, after the Obama administration froze the government's assets in retaliation for Muammar Gaddafi's crackdown on protesters during the Arab Spring. In response, oil output in the North African country dropped more than 70 percent. But unlike that asset freeze and the one imposed on Iraq after Saddam Hussein's invasion of Kuwait, which were done in concert with the international community, Maduro still has important backers, most notably China and Russia, which would serve as a likely veto of any international sanctions at the UN Security Council. If he's not getting paid, Maduro will surely divert the roughly 500,000 barrels per day of oil currently being sold to Gulf Coast refineries in the US to more friendly markets, like creditors Russia or China, as well as India, Malaysia and Thailand. But processing international financial transactions is very hard without going through the US or European banks. Transport costs would also jump because Venezuela's ports aren't well-equipped to load supertankers for transporting oil to such distant markets, said Russ Dallen, managing partner of Caracas Capital, a brokerage. Then there's the US$65 billion in Venezuela's and state oil company PDVSA's outstanding bonds, almost none of which are being paid and whose prices rallied 25 percent on news of Guaidó's challenge to Maduro's authority. If the U.S. were to hand control of Citgo to people selected by Guaido, as is expected, Maduro would almost certainly stop paying back loans to Russia's Rosneft, which in turn would execute a lien giving it 49.9 percent control of the Texas oil company. "Maduro was already facing an incredibly complex situation," Dallen said. "But the loss of fast cash from Citgo and the US market will further crush the country's decimated oil production and cash flows, meaning more starvation and more people fleeing the country."